Cat Fight Show on “Crazy For You”, The Late Johnny Maestro & More! Johnny Maestro Passes Away At Age 70! One of the greatest voices in music passed away on the evening of March 24, 2010 in Florida. He had been battling cancer for quite some time. The music of Johnny Maestro reached everyone who has ever turned on a radio. From his oldies staples with The Crests: (“Sixteen Candles,” “The Angels Listened In,” “Trouble In Paradise,” “Isn’t It Amazing” and “My Juanita” to his late 60s rock masterpiece “The Worst That Could Happen,” we’ve all been touched by his powerful yet angelic voice. I was fortunate enough to have interviewed Johnny Maestro back in 2006 and he was a first class interview. He cleared a few things up during our time together. It’s been printed in many rock n’ roll history books that he was born in Brooklyn, but in fact, Johnny was born on the Lower East Side of Manhattan. 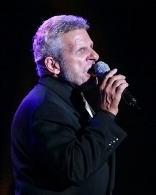 You can hear my entire interview with Johnny Maestro by clicking on my “radio interviews” page or listen to the podcasts at the bottom of this page. My first Live encounter with Johnny Maestro happened during the hot summer of 1995. It was a Saturday Night, mid-summer and I was sitting in my hot, non-air conditioned apartment in Boston’s North End. An Italian Feast was going on outside, but I can’t remember which saint was being honored. I was playing records and trying to keep cool, when in-between albums, I heard an angelic sound echoing off the city buildings. It sounded like the voice was singing “The Angels Listened In.” Could it be…THE Johnny Maestro? I ran down three flights of stairs and out front to find that the REAL Johnny Maestro was standing atop a bandstand at the fire station across Hanover St. from my apartment. My jaw dropped and for the next thirty-five minutes I listened to the incredible sound of Johnny Maestro. I told Johnny that story when I interviewed him in 2006 and we had a good laugh over it. He didn’t remember the actual event, only to say that he played many Italian Feasts in both New York and Boston. All I can say is that it was a magical night for me and one that I will never forget. Fellow New York doo wopper and music ican, Dion DiMucci posted this statement on his Facebook page. My Dear Friend ” JOHNNY MAESTRO” passed away today….. Last week we had wonderful & lovely conversations about our Lord. Johnny was a class act. He was truly a gentleman. :::…We will miss him. He sang “You’ll Never Walk Alone” like an angel…. Rest in peace, Johnny Maestro. Now the angels can hear you front and center. They don’t need to evesdrop anymore. PR Log (Press Release) – Mar 15, 2010 – Los Angeles, CA — Matt The Cat spent the better part of the last decade howlin’ nightly to a national audience over XM Satellite Radio’s 50s channel. On weeknight The Night Prowl Show with Matt The Cat took radio listeners prowling around the back alleys of early rock n’ roll and rhythm and blues. Matt interviewed and profiled such rock n’ roll legends as Lloyd Price, Aaron Neville, Big Jay McNeely, Dale Hawkins, Earl “Speedo” Carroll of The Cadillacs. Also Earl Lewis of the Channels, Pookie Hudson of The Spaniels, Sonny Burgess, Johnny Maestro and rockabilly guitar king James Burton just to name a few. Matt’s focus on doo wop, R&B, rockabilly and early rock n’ roll is unmatched on American radio today. He delivers the “story behind the story” on the hits that enthusiasts remember and the rarities that should have been hits. Memory Lane Cruises is pleased to announce that Matt The Cat will be joining its “Oldies But Goodies Doo Wop Mexican Riviera Cruise” from April 10-17, 2011. “This is an amazing event and I’m thrilled to be involved with such a legendary line-up. I can’t tell you how excited I am about being able to see the great Arlene Smith sing with The Chantels. I’m equally excited about The Olympics, Johnnie & Joe, The Pentagons, The Elgins and one of the most underrated vocal groups of all-time, The Calvanes. This is going to be one cruise for the history books and it shouldn’t be missed, if you LOVE 1950s rock n’ roll.” said Matt The Cat. Other Recording artists include The Six Teens, Hearts/Jaynetts, Exciters, Cookies, and Rainbows. Also appearing is Vel Omarr with a Sam Cooke tribute. “Matt the Cat is one of the most knowledgeable and respected radio personalities of early rock n roll. Matt will be our master of ceremonies and involved in the many Doo Wop activities planned for our guests.” said Williams. On April 10th 2011, the Oldies But Goodies cruise will leave from Los Angeles, California aboard Carnival’s new ship, the Splendor on a seven-day sailing to the Mexican Riviera. You will enjoy the most Romanic and exciting ports of Puerto Vallarta, Mazatlan and Cabo San Lucas. Be a part of this history-making event, and join us in bringing back the greatest Doo Wop recording legends of the 50’s-60’s. “There has not been an event this spectacular featuring these sensational Doo Wop artists since those memorable days we spent at the Brooklyn Fox Theater and El Monte Legion Stadium.” said Williams.